We love smoothies because we can combine our fruits, veggies, and superfoods into one delicious blend. We're all familiar with the classic green smoothie, which is great, but from time to time it's fun to swap out your typical go-to smoothie ingredients. Think of it as some spring cleaning for your taste buds. This ginger cauliflower smoothie bowl from Nicole Gaffney, Food Network Star finalist and author of the new cookbook The Art of the Smoothie Bowl, is far from the ordinary as it contains cauliflower as a base. Cauliflower is a nutrient-dense veggie and high in fiber, which helps support your digestion and balance your microbiome. Gaffney points out that you can't even taste it in the bowl so you get the health benefits without having the flavor overwhelm the bowl. Your taste buds can indulge in the refreshing taste of tart raspberries, sweet peaches, and a dash of spicy ginger. This colorful, flavorful treat is packed with all the good stuff and will be a welcome addition to your list of favorite smoothies. 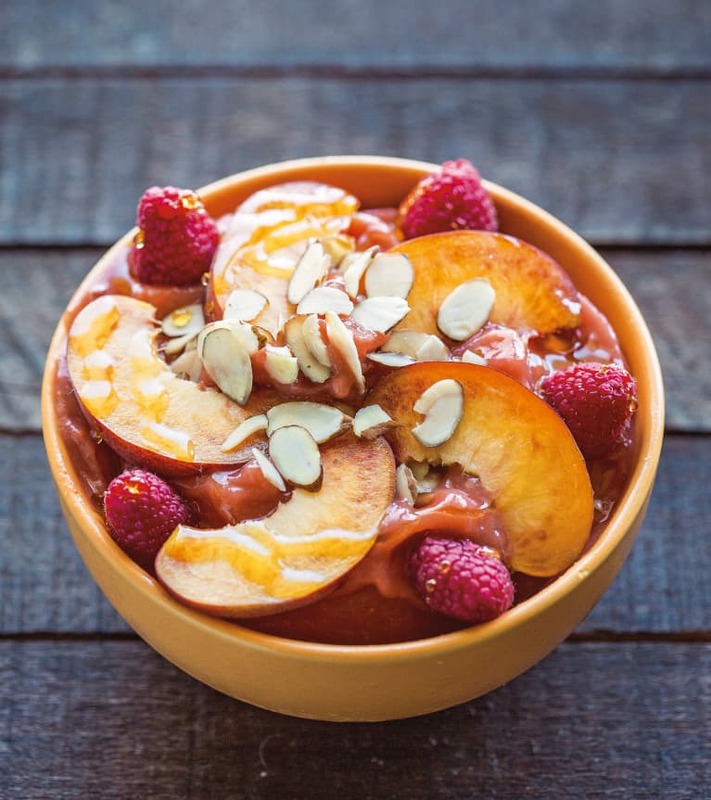 Add the apple juice, frozen raspberries, frozen peaches, frozen cauliflower, and ginger to a blender or food processor. Blend on high, using a tamper tool, if available, to smash down the ingredients and stopping to scrape down the sides as needed. Blend until the mixture is as smooth as sorbet, adding more apple juice, 1 tablespoon at a time, to help facilitate blending. Transfer the mixture to a bowl, smooth it out, then arrange the sliced peaches and raspberries on top. Sprinkle with the sliced almonds and serve immediately. Based on excerpts from The Art of the Smoothie Bowl by Nicole Gaffney with the permission of Page Street Publishing Co. Copyright © 2019.